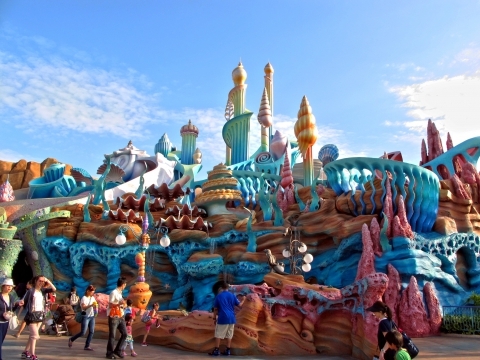 If you are planning a trip to Japan – whether independent travel, holidays with the family or in a group, go to Tokyo Disneyland ! Your child will become a real holiday vacations, if you give him a children’s tour of Disneyland. A huge amusement park with lots of thrilling rides will not leave anyone indifferent. Here you can spend only one day, and reserved impressions for the whole year. Japanese Disneyland is considered the most beautiful of all the world Disneyland. It was built in 1983, becoming the second in a row after the American amusement park. Disneyland in Tokyo was created by analogy with the Californian, but it is slightly larger than the scale. 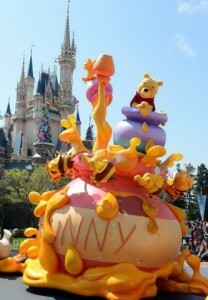 It is the only park of its kind, which does not belong to the company “Walt Disney”. At Disneyland in Tokyo, the, the Japanese owner – the company “Oriental Land”. 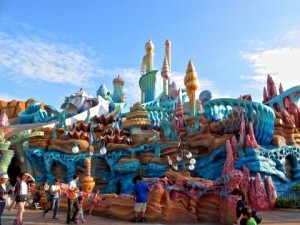 Disneyland in Japan is located in the town of Chiba , Tokyo suburb. It can be reached by train from the station JR Keiyo “Tokyo” to “Mayhama” station. The park operates all year round and regularly receives millions of visitors – adults and children from around the world. Disneyland in Tokyo becomes a “place of pilgrimage” every year more and more people. He ranks third in attendance after their American counterparts in California and Florida. Eight years ago, Disneyland Tokyo appeared related park – Disney Sea , or the so-called Disney Park on Water. 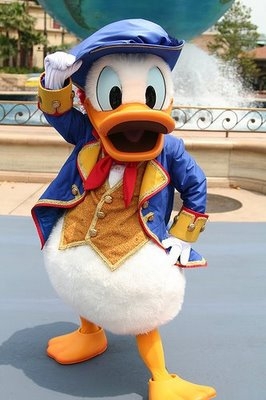 Despite the fact that Disney Sea pronounced nautical theme, stylistically and functionally interconnected parks are very similar. “The point of sending” a Disneyland Cinderella Castle. Around it are scattered everywhere attractions, restaurants, shops and other places of recreation. 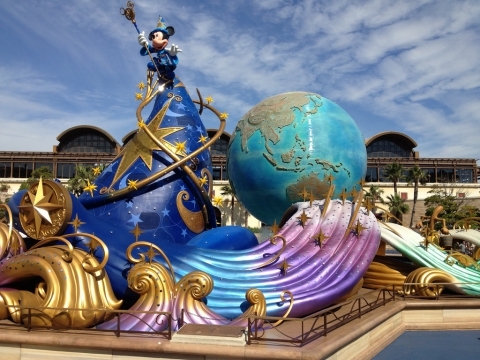 Tokyo Disneyland consists of seven separate parks: Lands of the West, the future of the Earth, Fantasy Country, Country Living, Country Adventure, Cartoon City and World Bazaar. All seven parks are dotted with a wide variety of attractions – swings, slides, carousels – for every taste and age. Each of the parks will take you into the magical world of fairy tales. Where you can feel like a cartoon character, a resident of distant countries, astronaut, tourist, etc. The parks are constantly held a variety of concerts, plays and performances of movie heroes of fairy tales and Disney cartoons. Thus, in the Western Lands you will meet miners, cowboys, Indians and other residents of the Wild West. Country Adventures entice in the wild jungles of Africa, diversity of Latin American markets, the humid tropics of Asia. In Fantasyland you make friends with the characters of fairy tales and together own counsels reveal the secrets of the evil witch. Cartoon city entirely populated by Disney “celebrities”. Here you can see Donald Duck, Chip and Dale, Mickey and Minnie Mouse, Goofy and other characters. From Lands of the Future you make a space flight on a magic missile. At Disneyland are parades in honor of the mass holidays, such as Halloween, Christmas, New Year. Events are accompanied by bright clothes, jokes actors, music. In the evening, life entertainment fairytale park in Japan continues. In all seven parks launch fireworks, which are accompanied by music performed by the orchestra. Disneyland in Tokyo is so huge that for movements inside the special train ride. They run every five to ten minutes in a circle at a distance of about five kilometers, and for all time make four stops. 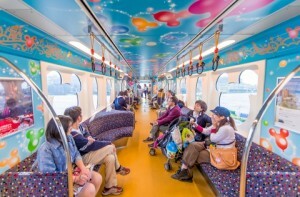 For those who are just beginning to entertainment at Disneyland, you can first do one lap on the train and see what fun is worth a try in the first place. During one visit is simply impossible to inspect all and master all the attractions of Disneyland. Visitors are offered guided tours, individual seats for kids entertainment centers for pets, accommodation in hotels, banks and many other services. For people with disabilities are provided special facilities. The serving staff make the park Japanese. They will try to do everything to stay in the park was the most comfortable for you. The entrance ticket or passport, as it is called in Disneyland, includes all rides for one day and is worth about $ 50 (prices may vary). You can also purchase tickets for two days, and on certain days, after 17.00 – ticket discount. Children under 3 years free admission. Tickets are on sale at the main entrance to the park. There are usually long queues lined up, so it is better, of course, buy tickets in advance, for example, in travel agencies in Japan. At Disneyland there is a clear mode of operation, but as a rule, it is open from 8-9 am and 21-22 hours. On the territory of Tokyo Disneyland, there are many shops selling souvenirs. For example, one of them is a huge suitcase. Grab a bite to eat or a tight offered in more than 50 restaurants with a wide range of food and treats. Relax in one of the three hotels will recuperate for new experiences and discoveries at Disneyland. 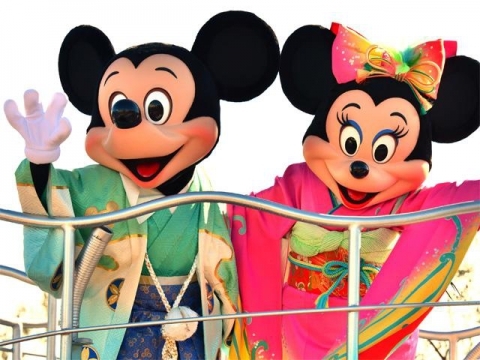 Treat yourself and your loved ones, give them a trip to Japan – an unforgettable trip to Disney World!